Lathyrus japonicus is a native perennial bearing deep-hued purplish-blue flowers that bloom July and August and succulent bluish-grey leaves that not only graces the shores with its beauty, but stabilizes the shifting sands with its deep expansive root system. A native perennial vine with succulent bluish-grey leaves bearing deep-hued pink to purplish-blue flowers that bloom July and August. 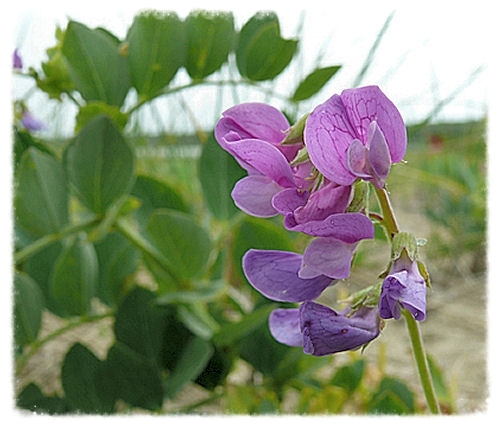 The beach pea not only graces the shores with its beauty, but stabilizes the shifting sands with its deep expansive root system. The developing and mature fruits further enhance its visual appeal. USDA map: to view county distribution for Ohio, double click Ohio several times. USDA-NRCS PLANTS Database / Britton, N.L., and A. Brown. 1913. An illustrated flora of the northern United States, Canada and the British Possessions. 3 vols. Charles Scribner's Sons, New York. Vol. 2: 413.